Henry Brooke pictured with the Sky Bet Chase trophy at Doncaster. FORMER Grand National-winning trainer Dr Richard Newland praised jockey Henry Brooke after the Yorkshire rider made all on Beau Bay to land the feature two-mile chase at Wetherby. The victory in Saturday’s £20,000 race continued Brooke’s fine record at the track after he became the first rider to record three successive wins in the prestigious Rowland Meyrick Chase when Grand National contender Lake View Lad prevailed on Boxing Day. Though Newland, victorious at Aintree in 2014 with Pineau De Re, predominantly uses Sam Twiston-Davies, he is happy to use Middleham-based Brooke in the North. “He is a very good horseman. 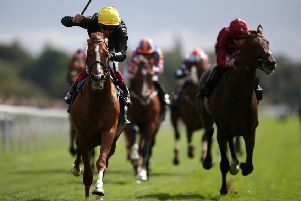 He’s ridden for us a few times and deserves every opportunity,” Newland told The Yorkshire Post. The win of Beau Bay slightly surprised Newland because he thought the horse needed soft ground to be seen at his most effective. Meanwhile, Catterick trainer Phil Kirby continued his fine form when Zig Zag won the handicap hurdle after jockey Sean Quinlan, already in the lead, kicked on as the field turned for home and left his rivals flat-footed. And Manwell followed up his New Year’s day win at Catterick by prevailing for Guiseley trainer Sam England and her husband Jonathan who was in the saddle.